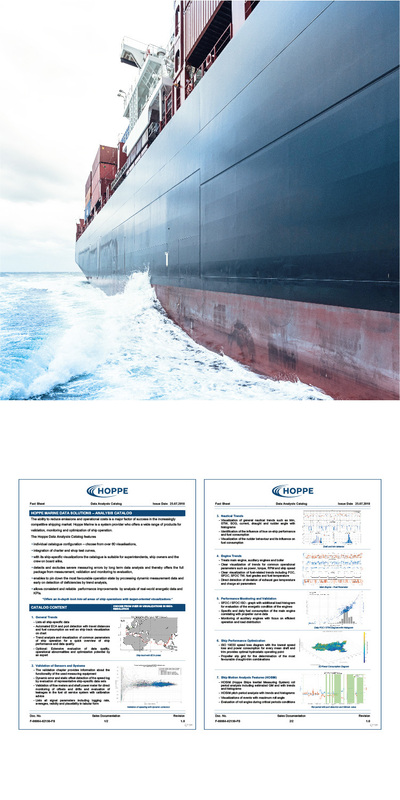 Hoppe Marine is a system provider which offers a wide range of products for validation, monitoring and optimization of ship operation. In order to meet the requirements of a full vessel operation rating, the Analysis Catalog was developed. The Analysis Catalog allows an individual catalog configuration – with a selection of over 100 visualizations and evaluation features as well as the integration of charter and shop test curves in order to compare the target and actual condition. Detects and excludes severe measuring errors by long term data analysis and thereby offers the full package from measurement, validation and monitoring to evaluation. Enables to pin down the most favorable operation state by processing dynamic measurement data and early on detection of deficiencies by trend analysis. Allows consistent and reliable performance improvements by analysis of real-world energetic data and KPIs.